love the white denim with the duck boots! now that looks like a quintessential Englishman hahahha. Nice jacket. nice shirt – wonderful hair. Just want to bury my hands in it. I like the girls' shoes too. Preppy heaven. If only he'd worn khaki chinos, sigh. Love the purple pants and loafers! Used to have a similar pair when I was younger and now inspired to hunt for some more. Love, love, love the color of her cords. So autumnal. LOVE her purple pants with the tan loafers! The boots are made for walking! Wait I can wear white now?! Obsessed with the eggplant cords! I want a college friend who dresses that wekk! Is it already time for winter boots in NYC? the boy is great all over, and on the girl I appreciate the colours and the tods. Nice t-shirt… I Love the stripes! He's got amazing style, I love the neutral tones together and how he did something unexpected with those boots. Amazing look! We love the color combination… Great! love the solid jeans, stripes, and military jacket combination. bad boot choice, however. those pants with those boots! i love it. I love the green jacket and the stripes on him, the colour of her pants encourages me to make a strip to a store to find a skirt or scarf thats similar. I dress like that guy. love that even though it's late october he's still in those slacks. those books make his hair look great. Just simple! They look like they came out of a forest an went directy to NY City! Cool! Love this…i wonder what they are talking about..
Love the color combo on her and the boots and nautical military thing he has going on. what's with the boots?? is it muddy in new york this time of year?? ? I would like. His boots. Mhmm, that is all. Thor you have never looked so good! Oh wow I know him! Campy chic for both of them. i know him! Montreal style representing! They look very european! Love it! I love this guy. The t-shirt are amazing, and what about the shoes? Amazing! digging NY vibe: love the look. So Bean boots are a fashion statement now? As a Mainer I am having difficulty wrapping my head around this! Sorry the bean boots are totally inappropriate right now- it's been in the sixties/ seventies. I know him! Congrats for making it on the site, Thor. Great outfit! He makes me want to apply to grad school. I really want a utility jacket just like that guys. love it! so preppy and clean cut! thor!! taken outside an NYU building. Nice use of white after Labor Day. These boots very nice, perhaps become excellent acquisition!!!))) I love it!!! Very cool, looks like a J-crew/LL Bean catalog. love the cords and how the woman plays with the volume of the puffy jacket and skinny cords! Im from Argentina and i know that you´ve been in Buenos Aires recently. What happened that you didn´t upload anything yet from here. You didnt find any trendy people? Hope you´ve spent a beautifull time! I love white pants, period. And with a military jacket, extra nice. Wonder where you get those boots? UH OH lovers spat! Maybe she's yelling at him because he out dressed her!LOL! Love his whole outfit. ps: to the world, he's been dressing like this for years. not a fan of white denim on a man. ever. love the rest of it. By the hammer of Thor! Godly boots! How cool is this guy !?! love the outfit ! ahh swoon he's handsom! plus i love that she has eggplant colored cords on! i love the worker boots! so cool, and the horizontal striped shirt is so stylish. Great photo, Sart. Love the chap's haircut, Barbour jacket, shirt, and trousers. 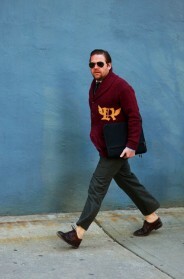 He has the right approach in general, but the duck boots are WRONG WRONG WRONG for NYC. I just received those same duck boots in the mail a few weeks ago! Nice to meet you, tomorrow's outfit! the guy is thor shannon! country chic in the city. He is not sure he is buying what she is telling him… Maybe Great body language and the guy the blend of summer and fall looks together it works so well! Love the maroon pants on the girl. ~not a fan of white jeans but he pulled it off with the boots and stripped shirt – nautical meets cowboy. The Nor'easter look is certainly back! I think its very handsome. Thor, you are just so completely lovely…and same goes for your ensemble. You're absolutely perfect. retrofitted for the 80s. i'm ok with this. I'm not loving the jean wash. Though he has really cool hair! Coiffed…no frills. I wonder if this guy knows he looks cool? love, love, love her outfit! I love his outfit, it could totally be worn by a man or a woman, and either would look chic as hell! see you both tomorrow. love you thor! My daughter made a quick trip home from school to con me out of a new pair of Hunter boots. I tried to get her to try a pair of duck boots because I like their lower cut and trad heritage. She shoulda opted for the ducks. I guess Hunters are a fad right now. I think I still have a pair in the garage somewhere but I only use them for work. Loved that you captured the comfortable lovely fashion, and the human connection. The two go hand in hand. first time comment-er….new lover of your blog!!! they could swap outfits and it would work out very well for both of them as well! Can't believe I'm about to say this, but I really like those pants with those boots. Never thought anything could get me to say something nice about Bean ducks (OD'd on preppy years ago), but… there it is. This combo is Europe Does Preppy Chic. nice. what i am REALLY excited about though is to finally see a woman on this site who is not 6'1" and 95 pounds. Yay for Thor! And the way she's matched her scarf and jacket. Hate to post a charity thing on here, but I've been following this blog for years and feel I deserve to make at least the amount I paid for the book (which is amazing, just saying) out of it. great photo! I love the barbour and de white pants!!! I just spent some time at Columbia a last month… memories! Ok, so I am the only one who finds it unappealing…white pants and stripped T in middle Auttumm??really?? Love white jeans in autumn/winter. Wish I knew what they were talking about! Love the boots! Ohhh those boots look spectacular with that outfit!!! love it love it love it! Those boots are the best. I wish I could find them in the UK somewhere at a decent price. Any ideas? love the moleskine in the pocket! I do need his boots in my life right now..
it's amusing to me that nyc is embracing the look that has been so common in the rest of the unurban world. when i wear a new york look in my city, it definitely stands out. if i wore either of these here, it would look like everyone else. having said that, it looks good. just status quo here in texas. Have you all seen the Michael Kors high heeled version of these "slicker lace-up rubber boots" for this season? In my wildest dreams, I never could have imagined a guy pulling off white jeans tucked into duck boots. He should be an inspiration to all men. I think that, being a british university student, this stereotype is all too prevelant and generally is to me this antithesis of fashion… but as it was taken in new york ill let you off because i do think it looks pretty cool! The guy looks great, the outfit is perfectly drawn together. My eyes are drawn to those Tod's and the matching jacket! I am surprised only one so far has spotted it! Likes: plum cords, her whole get-up; striped shirt. Issues: It's Indian Summer here in NYC. Everyone is wearing down and Winter wear when the low's in the 50's and the high's @ 70. Plus his boots – way too posey(and HOT) for warn, dry conditions. @ James Kay, above – I don't know about buying duck boots in the UK, but if you are willing to pay postage, either go to the LL Bean website for the country version just like this fellow is wearing, or if you'd like a more urban variety, look up Pome boots at Dr. Jay's (bonus: they're on sale right now). As far as I know they both ship worldwide. I just ordered some of the Pome black hip hop ones and can't wait to get them. boots and pants are a little outside of my bubble. LOVE the tods and cords!! The absolute proof that white jeans can look great on boys as well. His look is so simple but cool. He is my gorgeous down to earth little brother! Thor always knows how to rock a good outfit. He could wear a garbage bag and make it look hot! MONTREAL represent. I love you big guy! Love the boots of the guys they are made by "sorel" a brand for ski-wear! Hm. To me that just illustrates the problem with short pants. She's not short and stumpy by any means, she's just dressed that way. that's quite alright. not too bad. yayaya thor! always in great style and never without his trusty moleskin! I need a barbour jacket!!! Incredibly gorgeous and stylish kid. This picture is even more special to me because the boy looks like my (deceased) Irish-American father. Adorable beyond words. Thanks, Scott! Congrats on making it on here, Thor!! You look great!! They both look so chic! Anyone familiar with the bag at her feet? so made to be comfortable and practical. I love the pairing of rugged boots to a polished white jeans. Plus the striped shirt just makes it look chic. The hair and the facial expressions is just the cherry on top! um british home counties, circa 1985. there is not even a twist, that is exact. lame. I want to guy's outfit ASAP. So handsome! check out my fashion collages inspired by Philly's LOVE park. The vest?? Anyone know where it's from? and i'm also liking the backpack. The guy looks cool but in my opinion rather despite the white trousers than because of them. I've been staring at the girls outfit for a few minutes now and I just can't see the elegance of it. I've never seen a body warmer doing any good to a woman's figure (neither a man's). The colour of her trousers are lovely, and I think the combination with the beige might be nice, if only her jacket was made of a different material. Bottom lines: body warmers are no good! But otherwise I love the picture in itself! I love his look – he mixed a bunch of classics in a really fresh way. this guy looks like he spend to much time on superfuture or some kind streetfashion sites himself to much about a year and a half ago. The girl does sort of look like a euro student, but not ever would that look be called chic here in amsterdam at a university, more like a 'provincial' type, way to common to be seen as chic. Funny how the context changes so much for others view of them apparently. Moleskine in the pocket. Class. All the Shannon Family should be taken in picture, they are all so well-dressed and so down to heart. Thor, you look amazing on this one. Beautiful autumn scene. I love autumn. Sort of looks like he is wearing her clothes and she is wearing his? Thor, je t'adore! Always great, now come to Toronto please. Loving the "deep-in-conversation" moment you've captured here. His green jacket is perfect! Are the tongues on his duck boots cut? Thor is great and brings a smile to any room. His style is "timeless" in the sense that he doesn't conform to styles/trends of style spotted on the "campus" streets…A+ Thor, I commend you! All these wonderful comments about his clothing and sense of style notwithstanding, let's not forget why he's able to pull it off and make it look so good on him… those lanky long legs~ (doesn't hurt that he's got a gorgeous face though). This guy goes to NYU. An acquaintance of a friend. So funny to see him here! OMG I KNOW THAT KID!!! i go to nyu!! my name is jonathan wehne=!! This photo tell a story. I love his LL Bean shoes! looks a lot like the guy afew up?